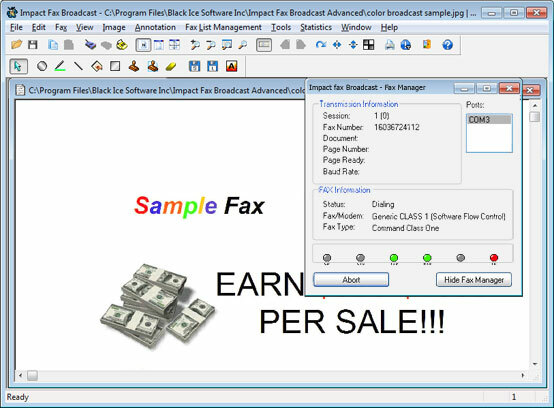 Impact Fax Broadcast is a specialized software application designed for reliable high volume fax broadcasting. Based on Black Ice Software's award winning open architecture, Impact Fax Broadcast is fully scalable from a single port/line up to 384 ports/lines; and is not tied to a specific fax hardware manufacturer and supports a variety of hardware including fax boards from Brooktrout, NMS, Dialogic and GammaLink. Impact Fax Broadcast is recommended for organizations of all sizes, from small businesses to large enterprises, that regularly use fax broadcasting for their administrative and marketing projects. Impact Fax Broadcast is a cost-effective, scalable and reliable software solution. Send Color or black & white faxes...or both! Impact Fax Broadcast can send color or black & white faxes to any number of fax numbers. When sending a color fax, Impact Fax Broadcast can automatically detect the receiving end's fax capabilities and if the recipient cannot receive a color fax Impact Fax Broadcast will automatically convert the color file into black & white to send to the recipient. Impact Fax Broadcast supports a wide variety of fax hardware, from off of the shelf fax modems to high end intelligent fax boards. For a complete list of supported fax hardware and vendors, please refer to the Supported Fax Hardware list. Impact Fax Broadcast allows you to customize your fax messages to match the needs of your recipients. Personalize sender names, recipient names, images/logos, entire cover pages , customized fax headers and more -- an huge set of fields means it's as personalized as you need it to be. View the status of your fax broadcasts while it runs! Start, pause, view and delete your broadcast jobs with the click of a mouse. Track your fax broadcasting activity through intelligent logging, including the status of successful, unsuccessful, pending and in-progress faxes. If a recipient of one of your faxes ever asks to be excluded from your future broadcasts, simply place their fax number in your Remove list. Any future fax broadcast can be filtered against your remove list to ensure that the Impact Fax Broadcast will skip delivery to that particular fax number. Once the Impact Fax Broadcast has finished, you can then manage all of your undeliverable fax numbers so you can keep your fax lists up to date and ready for your next fax broadcast. Any Class1, Class1.0, Class 2. Class 2.0 fax modem (not including "winmodems" or "softmodems"